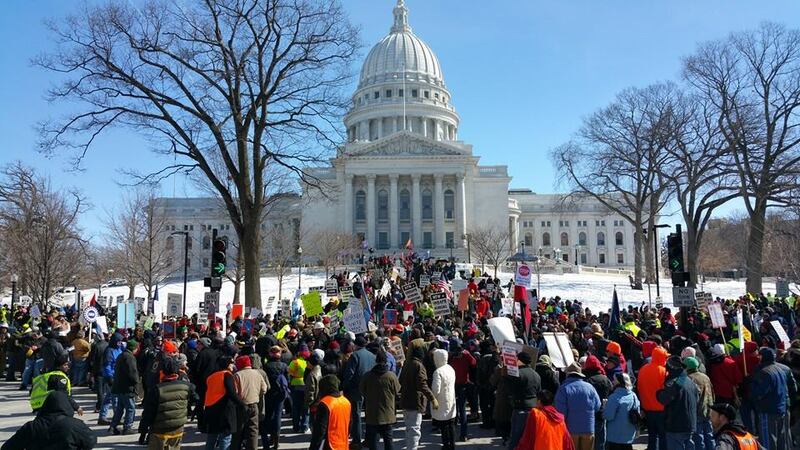 MADISON, FEB. 28, 2015 — At today’s protest of thousands at the state capitol in Madison, Stephanie Bloomingdale, Secretary Treasurer of the Wisconsin AFL-CIO, called on all workers and community members to come to the state capitol in Madison this week to stop the Wisconsin State Assembly from voting for right-to-work-for-less. “We are not going anywhere. We need to stay all day and all week,” said Bloomingdale. 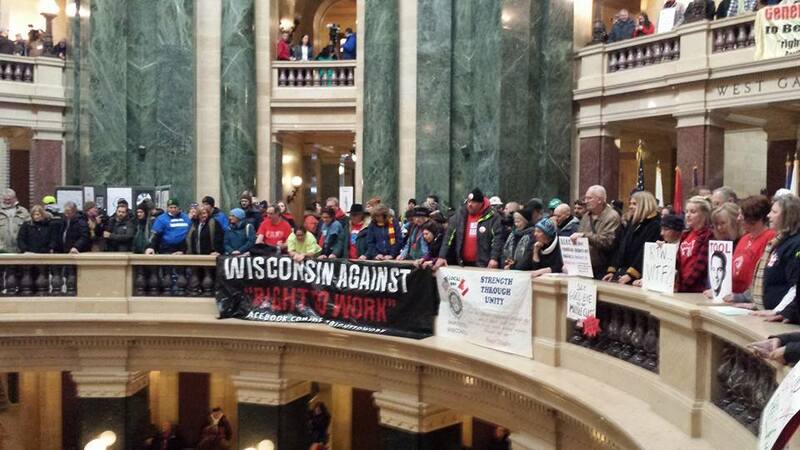 On Feb. 25, the Wisconsin State Senate passed an RTW bill. The bill needs to be voted for in the majority by the Assembly before going to Gov. Scott Walker who has said he’ll sign RTW legislation if it comes before him. The Labor Committee of the Assembly will convene at 10 a.m. Monday, March 2. 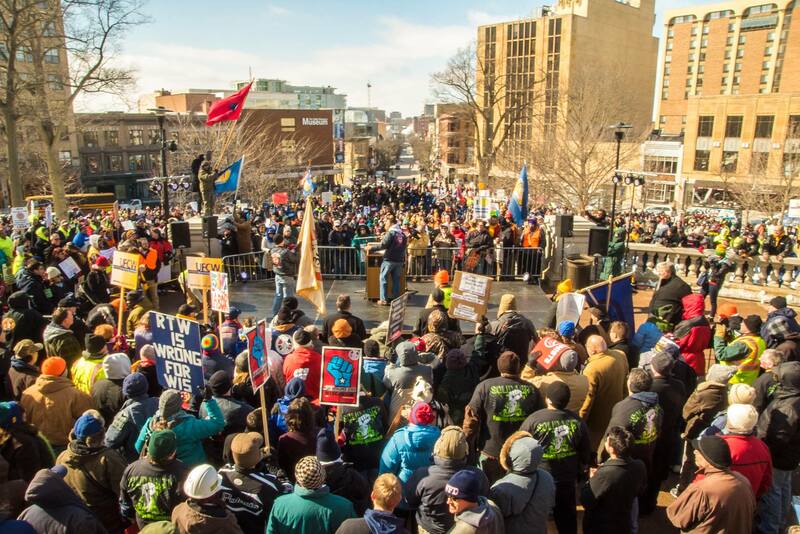 Labor-community forces will be there to say NO to RTW. 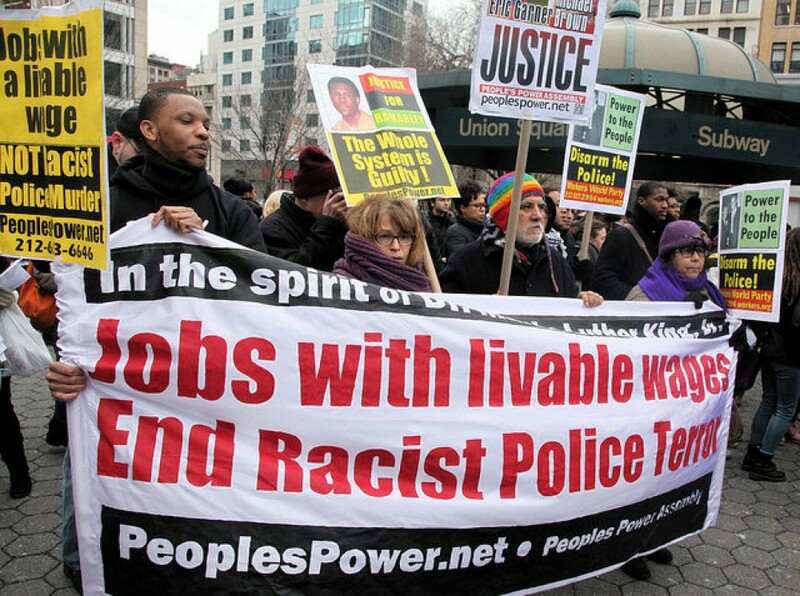 Numerous labor and community supporters participated Feb. 28 including Fight For $15 activists, youth, seniors, women, the LGBTQ community, environmentalists, faculty, students and the Black Lives Matter movement. 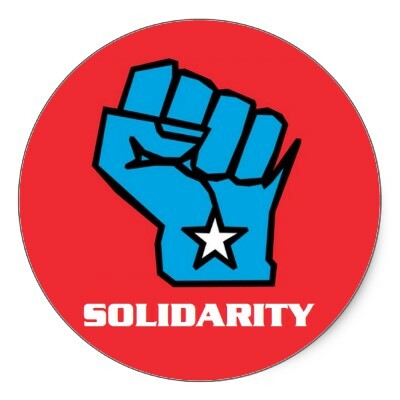 “We are in solidarity. 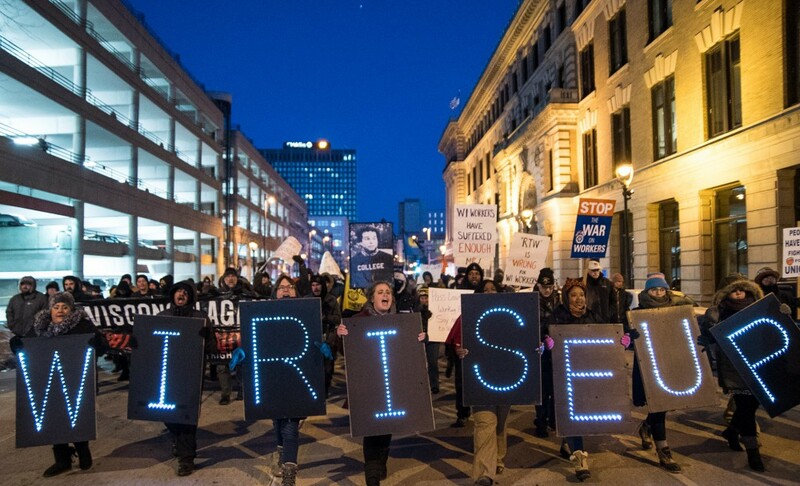 There are so many forms of state violence and right-to-work is one of them. Mass incarceration and poverty are state violence. We have to see the commonality of our struggles. We can and will stand together and fight,” said Eric Upchurch II of the Young Gifted and Black coalition while inside the state capitol Feb. 28. Be There! Tell your co-workers, neighbors, kids, parents and other loved ones! Monday, March 2! 10 a.m. Labor Committee of the Wisconsin State Assembly. State Capitol, Madison. PACK THE CAPITOL TO SHUT DOWN RTW & RELATED AUSTERITY! 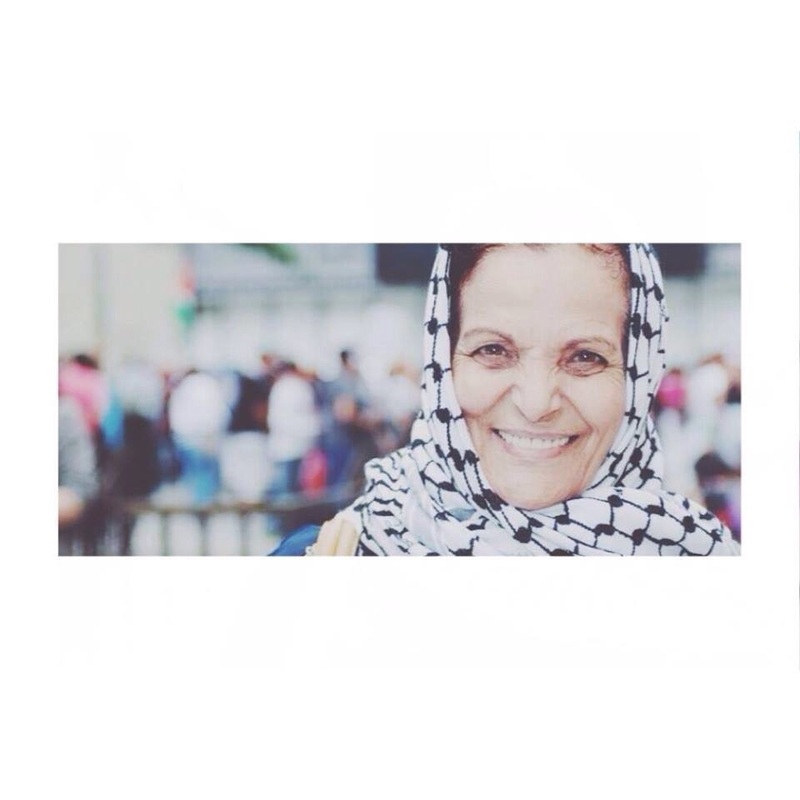 ALL OUT For Detroit to Support Rasmea at Her Sentencing Thurs., March 12! Shut down right to work for less! Build a fighting worker and community movement! 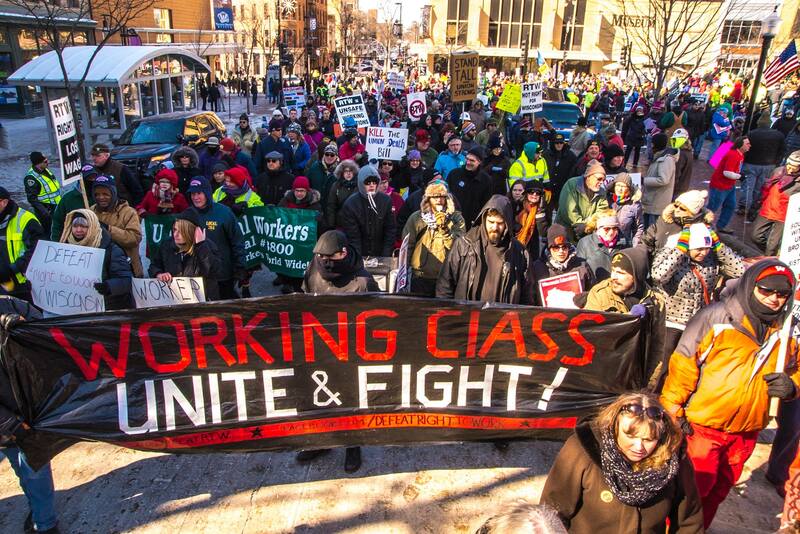 Working families will rally in Madison on Saturday at noon at the state capitol to oppose right to work. Late on Wednesday, the Senate passed a right to work bill and the Assembly is expected to take it up next week. This bill will cut wages and benefits for all Wisconsin workers, increase workplace deaths and erode the working class. Stand in solidarity as we continue to raise our voices against this attack on working families and our communities.